Installed miles of high-voltage underground electrical transmission infrastructure. Built out public and private electrical distribution networks. Constructed or reconstructed electrical substations. Designed and built methane collection systems spanning hundreds of acres of landfill. Directionally drilled multiple utility lines under rivers and highways including at distances over 1,400 feet. Micro-tunneled utility lines through ledge. “Jack & Bored” utility lines under active railroad tracks. Replaced several large active steam lines in dense urban environments. installed or replaced hundreds of miles of active water/sewer/drain lines. 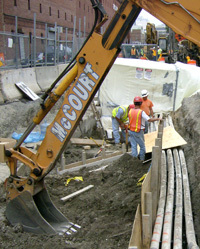 McCourt Construction does not share on its web site details of work we perform for private customers (including utilities). For more information on our utilities experience please contact us.